Despite my love for furry animals, before entering the blogging world I was too terrified to ever wear anything animal print. Intimated by its bold eye catching allure, I simply pushed the print aside as "not me." It wasn't until a few months into Fash Boulevard that I became determined to find a way to incorporate the fall staple into my wardrobe. It started with a scarf and spread like wildfire. These days I'm wildly obsessed with all things animal inspired and with Africa on the mind, I figured a little dedicated post was only fitting. 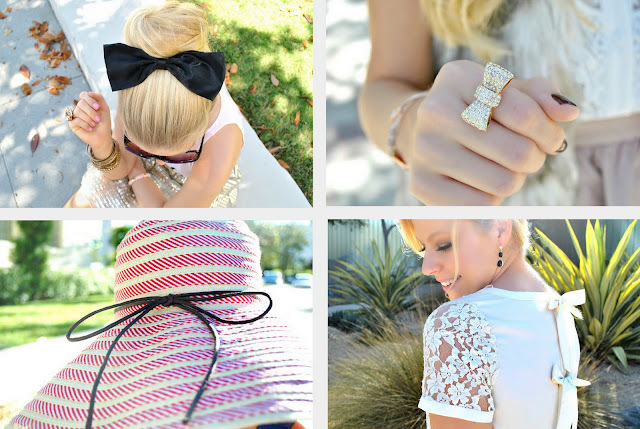 Visit my Little Bow Details post to witness my growing collection of anything donning a bow! I am so glad you decided to embrace animal print. You look crazy fabulous! oh wow I love all these bracelets! my thoughts are as yours, before I escaped from those prints because they looked too wild for me.Now, I love them! ! great looks, the shoes are really awesome! ! Haha. You're hilarious. Can't wait to hear all about Africa. You have fabulous shoes, I was drooling over every pair! And animal print really is the best, it's crazy how versatile it really is. I just adore leopard prints, you look amazing dear! Obsessions are good ;) in moderation! Love these outfits and the details.. You are always dressed to the T and look so gorgeous and girly! SO cute. loving all of the animal print inspiration!!! You are such a great writer, hun. Adore all of these pictures. The heels in the first outfit are amazing. I'm happy you turned to the animal print side. You look gorgeous in anything. OMG, I'd kill to go to Africa. That is so exciting. I love the booties in the last pic and that leopard blazers a few down. Stylish and chic. Muy guapa, perfecta me gusta es animal print, también tengo varias prendas, besos ana. love animal as well! where in africa are you going? we've spent time in kenya, tanzania and Rwanda and loved all of the countries! You're coming to Africa! That's so awesome. I promise you will absolutely love it! which country / countries are you hoping to visit? im obsessed with all things animal prints too and congrats on the upcoming trip, love this post! Prints. And I'm so happy for you that you are travelling to africa next year. That sounds real fun. Wish you a great day, Anna. I live in South Africa! So if you by any chance land in Johannesburg let me know then we can meet for a coffee!!!!!!!!!! Would be SOOOOO amazing to meet you! Love the wild look on you. ;) Thanks for going over and beyond with all the looks. You gave us a lot of ideas and options. I love your style. You definitely aren't afraid of animal prints now! Love those giraffe shorts, adorbs! And you're going to Africa?! How AMAZING!! SO jealous! I am obsessed with leopard print too! It goes with everything!! I love to do it in accessories like scarfs and shoes! Love your animal print round up...looks great!! I think I just fell in love with every one of those outfits! Question: I'm dying to try out knee socks and dresses and thigh high socks and dresses (you rock them pretty well! )...any suggestions for how to pull it off and where you actually find good, inexpensive sock options? loving those prints on you doll! Super cute post dear! So inspiring! oh i just love those booties!! you're too cute! I feel the same way! I thought it was too much for me and now I wear animal print once or twice a week! I love this little tribute! I am in love with this black bow pumps in the first picture! I am so jealous of your trip! I hope you bring home the cutest little pet of your dreams! You're taking a trip to Africa? Soooo jealous, that's at the top of my must-visit list. Where in Africa are you going? I love animal print! I know some people think it's tacky but I can't get enough of it. I have been that way since I was younger...obessesed with anything Lisa Frank because a lot of it was pink and leopard print...lol. 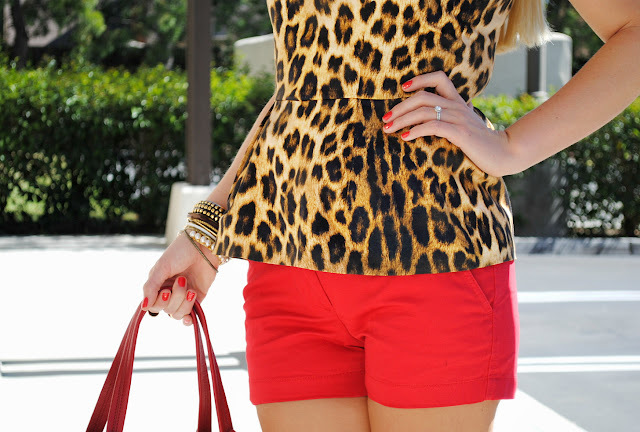 I love the way you styled it, my favorite look is the leopard print peplum with the red shorts. That arm candy is flawless. Thanks for the inspiration! I'm totally loving leopard right now too! You look gorgeous in every outfit. Geat outfits and pictures, I am starting to love leopard prints! Love the jacket in the fifth photo!!! Where's it from? Love your looks especially the homage to the bows. I've developed a serious liking to bows. 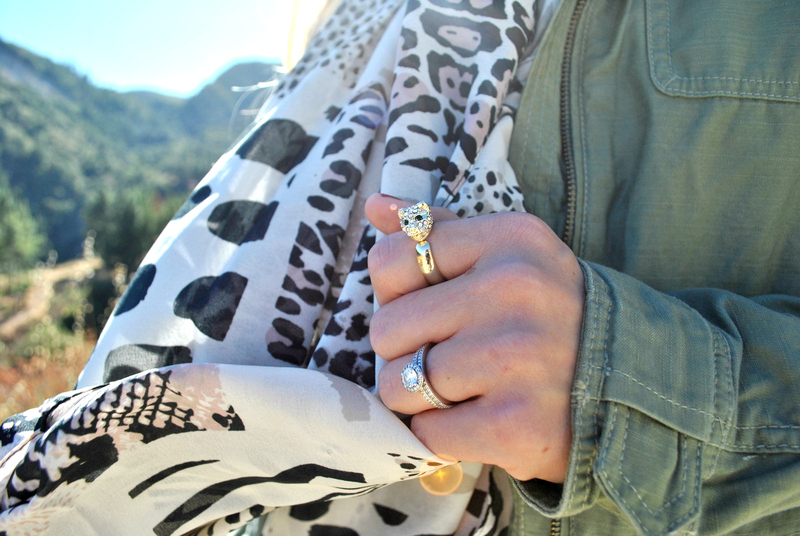 I'm obsessed with leopard and animals too! Even my dog watches Animal Planet. :) Fun post! Ohhhh my goodness! One outfit is cuter than the next. I love love the knee high socks too. I think though my favorite of them all are the animal print booties. I read in a magazine that leopard print is now considered the new neutral! I love it :) I recently got a new pair of leopard flats and I wear them everywhere. I'm slowly but surely adding more animal print into my wardrobe. You look amazing in ALL your outfits. I love your dress! I felt the same way about animal print; it felt too Jersey Shore for me until I also began to blog and read other people's wonderful blogs. Now I can wear touches of it. I adore your black heels with the bow. 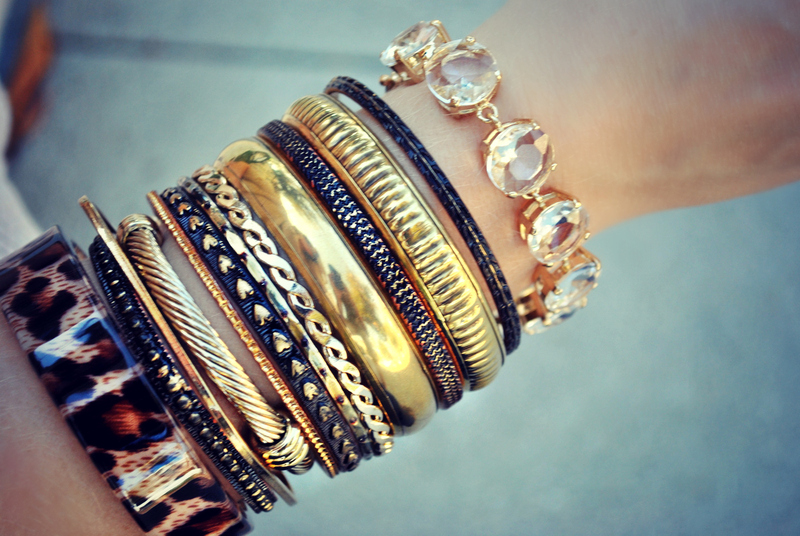 I love all of your bracelets, so beautiful, so many! I LOVE the first picture of you with the red knee-highs. So adorable! You are always fashionable in any print you put on! Have a great time in Africa and enjoy planning! Love love love all of these. Your style is flawless. I love how you are not afraid of trying so many different wild looks! Love the animal prints! I love all animals too! Ok I am so jealous you are going to Africa! That is insane! I've recently been loving animal print. Faux of course. Love this post! all your outfits are great! I agree with you that most animal prints are intimidating, but once you take the plunge you can't look back! Lovely way to wear animal print, I love it! How exciting to go to Africa!! I'd give ANYTHING to be able to travel the world. I love everything animal print so I understand your obsession, girl! I used to think animal print wasn't for me either. But my plunge into the blogging community has definitely changed my mind! Loving your pumps in the first look! Adorbs! Bows and leopard print, oh my! My favorite outfit is the leopard blazer with the sheer top and shorts. I also really like the knee socks, but I'm not sure I'd be able to pull that off, myself. What a lovely post Anna. It's nice to see people with signature style. My favourite animal print is python - can't get enough! And wear it on anything, with everything. Leopard print look amazing in you!!! Ooooh i love the animal print too...it's become such a classic timeless piece in my closet!! Love your style! Bows are in :-) Those leopard wedges are to die for! I totally love your style! This is an amazing outfit you look gorgeous! Now I feel like I need to get more animal print! You pull off animal print well my dear! I have to admit I don't wear it too often, despite having owned a ton of it in high school. Looking great as usual! You really do animal print so well. It's been a while since I've been here and I've missed you! I love animals, and animal prints. If you styles it well (and you do) is classy and feminine. omg that trenchcoat looks AMAZING!! I´m also wildly obsessed!!!! I have animal print everywhere! I know what you mean about leopard print, I never used to wear it as I was worried I'd look trashy, now its one of my favourite things in an outfit! So many amazing looks, I love the peplum tops and the blazer with those shorts!! WOW!!! You look stunning in every. single. photo. :) I am with you 100% on the love for animal print. Those leopard print shoes are gorgeous. I simply just ADORE all of these looks!!! It really pains me to hear you say "Africa" as if it was a country, not a diverse and expansive continent with millions of people who speak hundreds of different languages. guest writers to write content available for you? I wouldn't mind producing a post or elaborating on some of the subjects you write about here. Again, awesome web log! Hey there, You have done an incredible job. I'll definitely digg it and personally recommend to my friends. I am confident they will be benefited from this web site. It's not my first time to pay a visit this site, i am browsing this site dailly and take nice facts from here daily. Link exchange is nothing else except it is simply placing the other person's webpage link on your page at appropriate place and other person will also do similar in support of you. Hola! I've been following your blog for a while now and finally got the bravery to go ahead and give you a shout out from Huffman Tx! Just wanted to tell you keep up the excellent work! I'm really enjoying the theme/design of your website. Do you ever run into any internet browser compatibility problems? A small number of my blog readers have complained about my website not operating correctly in Explorer but looks great in Chrome. Do you have any suggestions to help fix this issue?